Save 15%, stay up-to-code, and avoid costly errors. The 2017 edition of the bestselling NEC® Set includes the new National Electrical Code® and its expanded, full-color NEC Handbook. Stay up-to-code in a rapidly changing field with NFPA®'s most popular NEC Set. Receive the 2017 edition of NFPA 70®: National Electrical Code in the portable Softbound format that's the top choice of electrical contractors and installers. To guide your work, the expanded 2017 NEC Handbook features expert commentary, examples, new navigational aids, and more full-color visuals than ever before. The NEC Softbound and NEC Handbook Set is #1 for a reason. Order today! Invest in electrical safety and Code expertise with the #1 NEC Set. Be prepared in the new electrical environment. Work with the 2017 edition of the NEC Softbound and its trusted NEC Handbook loaded with solutions and in-depth support. Order the economical NEC Set thousands of contractors, installers, designers, and engineers won't work without. 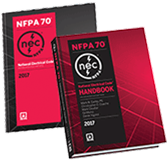 Get the 2014 NFPA 70®: National Electrical Code® and NEC® Handbook together in the 2014 edition of the bestselling NEC Set. Stay up-to-code and save 15%! Update to the new benchmark for electrical safety! As the 2014 NEC advances to allow for safe implementation of the latest in electrical system and equipment technology, the 2014 NEC Handbook helps you stay up-to-code by explaining the reasoning behind Code concepts. In today's field, there's no substitute for the 2014 NEC and NEC Handbook Set.